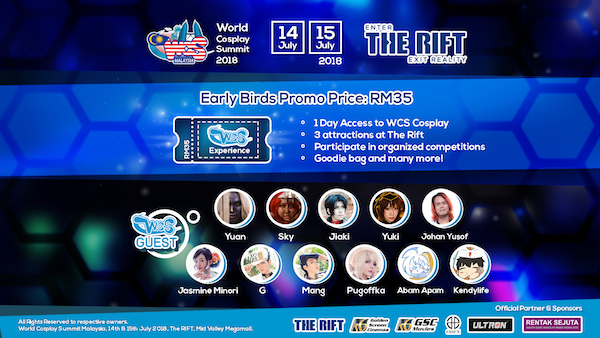 World Cosplay Summit – Malaysia takes place from 14th – 15th July 2018 at The Rift @ Mid Valley Megamall for the regional preliminary rounds selection followed by finals at Nagoya,Japan on 28th July 2018. World Cosplay Summit Malaysia is an immersive event for the local Malaysian cosplay and sub-culture scene. The “World Cosplay Summit (WCS)” was created to promote international exchange through the Japanese youth culture of manga and anime. The free and dynamic nature of manga was instrumental in the birth of cosplay. Nowadays youth from around the world find this as a common language and a dynamic new form of global interaction. The World Cosplay Summit began in Osu, Nagoya and has grown to include more than 36 countries from around the world. If you count audience and participants at each preliminary event, the number of people involved is now in the 100s of thousands. There are wide variety of exciting programs throughout the event which will be coming. YukiGodBless+JiakiDarkness will be performing as well with their singing talents. ← Vending machine for free magazines?